The Victoria Ground is no more. Perhaps the most enduring constant in the history of Stoke City Football Club, ‘The Vic’ sits quietly in the distance, still silhouetted against The Potteries skyline, awaiting its fate, while the dreams and aspirations of thousands of Stoke supporters are focused on the Britannia Stadium. 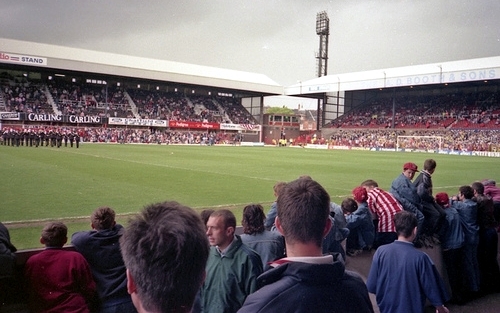 The final league game against West Bromwich Albion on 4th May 1997 marked the official end of football at the Victoria Ground, and the end to 119 years of Stoke City supporters turning up at the same place to watch their side take on the very best teams from not just this country but all over the world. Such an occasion was always likely to be an emotionally-charged one and it was. A full house turned up to say goodbye and it was left for them to bid their farewells in their own personal way. For some it was a time to be loud, bright and cheerful, others looked on more quietly as they took it all in for one last time, and then for a few it was, understandably, a time of tears. It was an almost surreal feeling to be in the ground for that last game. The game on the pitch was important but not as important as taking in the Victoria Ground experience for one last time. The parade of former players before the kick-off reminded us of the great players in the past who have graced the red and white stripes of Stoke City down the years and given us so many happy memories. As we watched them walk around the pitch it was clear that they too were tasting the atmosphere one last time and perhaps drifting back to an era when the Boothen End chanted their names and sang their praises as they gave their all for the club. Supporters like to think that nobody cares for the club with the same passion as they do, but watching these great men as they trod the turf for one last time you got the feeling that they pushed us a very close second. For me personally it was the most emotional part of the whole afternoon. The ground was a sea of colour, mainly red and white but with a sizeable portion of blue and white at one end of the ground. We were fortunate to have West Brom – with their full attachment of attendant die-hard supporters – as opponents, to make sure that the last ever competitive match at The Vic was graced by a sell-out crowd. The fact that The Baggies were the last ever opponents at ‘The Vic’, having been the opponents for our first home league fixture way back in 1888 added to the sense of occasion, though you wonder if the fixture computer is as random as we are led to believe? The league position of both Stoke and West Brom rendered the result of the match technically meaningless, though for Stoke it was clearly important to bow out on a winning note (as well as avenging that 0-2 defeat back in 1888! ), while for West Brom there was the matter of their recent sixteen-match barren spell against Stoke – a festering sore for their supporters I’m sure. Any anxiety that our supremacy over West Brom would end and the farewell to ‘The Vic’ would be a damp squib came to nothing though as Stoke controlled the match with the same sort of ease that had seen Port Vale polished off in the penultimate home fixture of the season. West Brom clearly wanted to spoil the party and to prove it they annoyed everybody by winning the toss and turning Stoke around so that they would attack the Boothen End in the first half. Even so, that set-back and losing Mike Sheron midway through the first half did little to enhance West Brom’s chances and Stoke always looked like they were going to make sure that we said goodbye to The Vic with a victory. It was vital that we netted at the Boothen End in the last match and the history books will show that it was Gerry McMahon who delighted the thousands behind that goal by doing just that. From that point on there was never really any doubt about the eventual outcome. West Brom’s desire to fmally turn the tables on Stoke floundered against a second half bombardment from Stoke which saw many chances go begging and a ‘goal’ get chalked off for offside before Graham Kavanagh put the seal on victory with the second goal of the game. That goal kept the Victoria Ground faithful in fine spirits throughout the second half and the only black cloud in an otherwise clear blue sky came when Andy Hunt profited from a desperately odd penalty decision for the second year running to bring the score back to 2-1, and so become the last player to ever score a league goal at the Victoria Ground. The game was all but over, though there was just time for The Baggies to show how desperate they were to avoid defeat when they rather shamefully refused to give Stoke the ball back from a throw-in after it had been booted out to allow Justin Whittle to receive treatment. Shame on them; I hope Stoke players recall that incident this season should the occasion to reciprocate arise! And so it was over. At the final whistle only a few supporters chose to ignore the club’s plea for supporters to stay off the pitch and it wasn’t too long before they too cleared the playing surface and allowed the team and staff to come out for one final lap of honour. Most people stayed behind to applaud the lap of honour, saying goodbye not just to this team but to all the teams that have represented us down the last 120 years or so. The players on the day were representatives of all the players down the years to have worn the famous red and white stripes and it was a farewell to all of them. 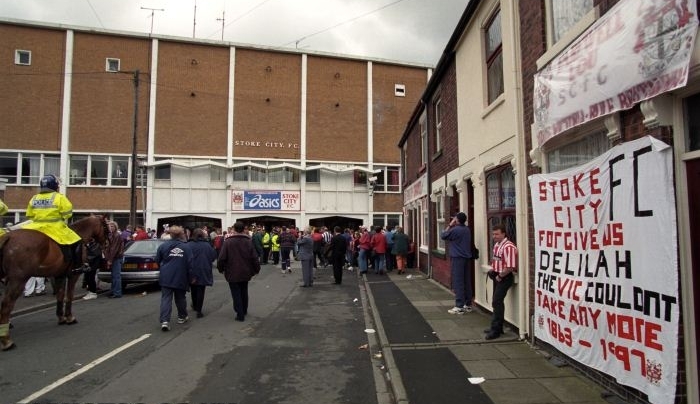 You could see Stokies with cameras and camcorders making sure that they recorded to film the spots where they had stood for so long and the friends who had stood there with them. Others just sat there on the steps for some time as they said their last farewells and occasionally you could see a tear roll down a cheek before being wiped away. Regardless of whether you were excited about the move to the Britannia Stadium or not this was still a time of great emotion and remembrance. As far as the Victoria Ground went, that should have been it. We had said our goodbyes and we should have been able to consign that great day to memory and start to look forward to our new life at the Britannia. However, circumstances and some bad planning put paid to that idea. You can’t complain when your reserve and youth team are doing well and so, when we reached the final of the Pontins League Cup and also the final of the Midland FA Youth Cup we were forced to play out two more matches at ‘The Vic’. The first game against York City in the Pontins League Cup Final, three days after the West Brom match, saw Stoke run out easy 3-1 winners, and three more days after that our junior team put the seal on a notable season of success for Stoke’s junior sides by completing a 3-1 aggregate victory over Premiership Aston Villa. Supporters wanted their final memory of the Victoria Ground to be the occasion against West Brom and thus, understandably many chose not to go to either of these two cup finals, leading to much lower crowds than we might normally have expected. That was a question of circumstances and everybody accepted it. However, the decision by the club to then play two more pre-season friendlies at ‘The Vic’ prior to the start of this campaign did not strike a cord with most supporters. 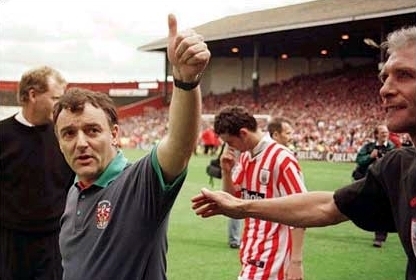 There was a general feeling that we should have not played another home match until the Britannia Stadium was ready. 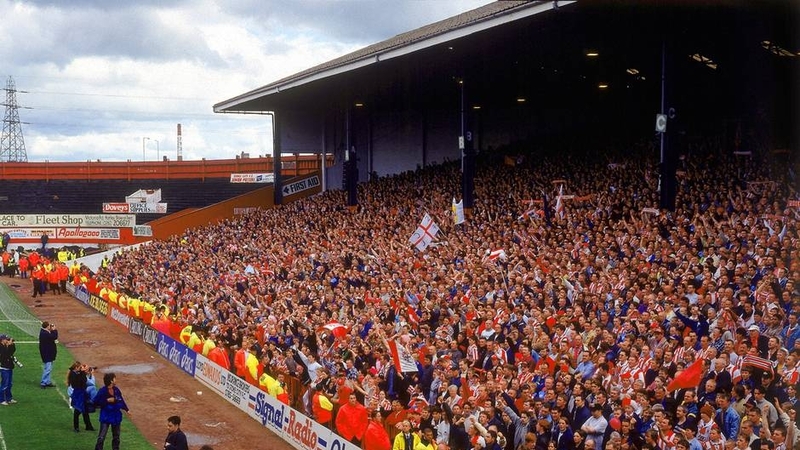 Most Stoke City supporters had said their fond farewell to the Victoria Ground on 4th May and it was not easy to go and stand on the terraces again. An exception could be made for Cranny’s testimonial against Everton (even though it could still have been played at the Britannia once the season got underway) but the Coventry match was just too much for many supporters. Really the game should never have been played. A crowd of only 4,000 turned up and that does no justice to the memory of the ground. The fact that Stoke scored a fine 2-0 win over the Sky Blues will not live long in the memory but the sight of a sparsely populated ground, shrouded in a ghostly silence, certainly will. At the final whistle, many supporters didn’t know whether to say another emotional farewell to the place or just to leave straightaway. Most chose the latter, and who could blame them. The goodbye process had been dragged out for way too long. As you walked away from the ground for the last time there were some questioning just why the club, having arranged the game, had not bothered to advertise or promote it as the last ever game at ‘The Vic’!? Twelve months ago we had been promised a glamour friendly against top international opposition to bid farewell to the place, and there had even been talk of a concert. 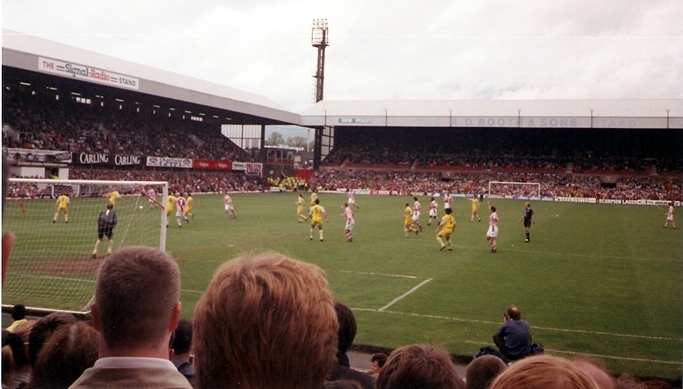 Even though those two promising ideas came to nothing, the club could still have avoided the Coventry spectacle by making sure that the West Brom match had been the last first-team game to be played there and arranging all of our pre-season matches on away soil – a course of action taken by Bolton Wanderers who said goodbye to Burnden Park at the end of the season and now wait to move into their new Reebok Stadium home. Regardless of whether you agree with the decision to play those games against Everton and Coventry, the fact now remains that the days at the Victoria Ground are over, and let’s be fair, putting an end to Port Vale’s fanciful play-off hopes and adding yet another victory a seemingly never-ending list of triumphs against The Baggies was no bad way to say goodbye!